Why don’t they want to deal with their finances including tax the right way? Although for most of us who are unlikely to fly on a private plane to stash cash in tax havens, we can spend our time understanding how the tax man works so we can sleep well at night. 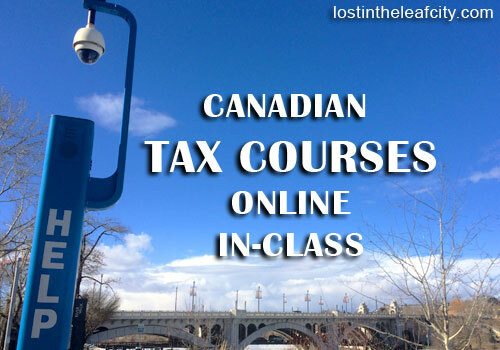 This post is all about Canadian tax courses for everyone. But I’d like to emphasize the importance of knowing the Canadian taxation especially the income tax preparation for newcomers. Our first stop is on the website of Canada Revenue Agency (CRA) or Agence du revenu du Canada. For starters, this income tax information is a must read for all Canadian residents especially for newcomers who can learn the eligible benefits to claim from the Government of Canada. To what extent are you willing to learn? Will you pay to invest on your education, to a skill we can use as long as we are considered a Canadian resident? The advantages can help you decide. Invest in education and learn new skills, additional career assets. Understand why you pay taxes and how the taxes are used. Stay updated with the Canadian Tax Laws. Get the benefits (GST/HST credit, Canada Child Benefit, Working Income Tax Benefit etc.). Submit income tax return online or mail. Become a saver. Save by doing your own taxes. Become an investor. Know the effects of investment on registered (TFSA and RRSP) and non-registered account. Honestly, the last two advantages are my goals (financial independence or simply findependence) in writing this post. I never looked the same way again at my payslip when I filed my first online income tax return years go. Don’t you want to know where those numbers come from especially the refund (if there’s any). Maybe people are only interested (or annoyed most of the time) to know how taxation works when they owe the Government of Canada. Ouch! That can also be a good motivation to educate yourself. Any driving force will do. OK so now that you have the WILL to learn (if not, why wouldn’t you. Really!). I’ll take care of the free resources online which includes the tax course in school in case you don’t mind spending more time and money to learn more. I wouldn’t be surprised if you choose that route. I will start with the most accessible way of learning–online courses. This post will focus on personal income tax course but I’ll also include the other tax-related courses in each school for others who are looking for more advanced tax courses. Even if you don’t want to become a tax preparer, have a look at the courses for discounts especially during tax season. Share the information to someone who are interested. A sister who has a knack of crunching numbers. A self-employed friend who ventures in different projects. But why not start with yourself. Evelyn Jacks, President of KB, is also known as the author of Essential Tax Facts, a Canadian bestseller. The Knowledge Bureau is more than a tax school that professional would be more interested in the online courses than someone who wants to learn personal tax preparation. If you are seeking a career in finance then have a look at the course catalogue. It can help you plan the path to professional designation as a Master Financial Advisor (MFA) or as a Distinguish Financial Advisor (DFA). I haven’t thought of Udemy; although, I’ve used it on taking paid and free courses depending on what I’m working on which honestly could be anything. To my surprise I discovered the course Preparing Canadian Income Tax Returns by Ian Dinovo. As of this writing, the course has 208 lectures and 20-hour videos. It costs $200.00 with a 30-day money-back guarantee. I haven’t request for a refund of any courses I paid for on Udemy. With almost 5 star rating, I could add it on my list of courses in the future. You could read the reviews to see if this is an online Canadian tax course that fits your need. This course is for Canadian residents only. It doesn’t matter whether you’re a tax student or like me who wants to learn how to prepare a personal income tax return. Tip: Some students like watching videos and reading notes. You can sign up for free on Udemy to try the free courses and get a feel of the platform. Watch the five free sample videos of the course to test the video and audio. So far we have two tax schools you can choose from. The good news is there’s more in the Part 2 of Canadian Tax Courses in the next post. Have you tried any of the courses or paid/free tax software? Share in the comment.